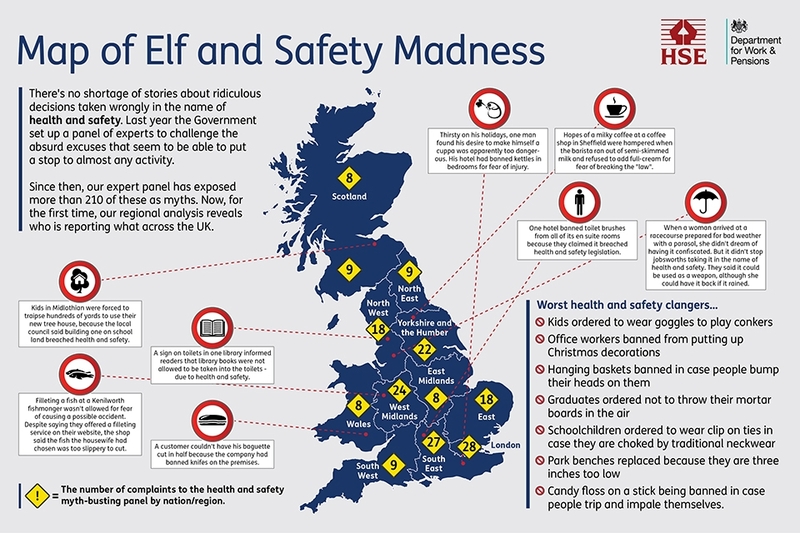 Residents of London and the South East reported the highest number of bogus health and safety excuses in the United Kingdom, according to a new analysis of reports submitted to the HSE’s Myth Busters Challenge Panel since its founding in April 2012. The panel was established to assist the public in challenging petty decisions made under the guise of health and safety. Unfounded health and safety excuses, often accompanied by the justification ‘Sorry, can’t do that because of health and safety’, damage a business’ reputation and undermine the seriousness of actual health and safety regulations. Health and safety law protects workers and saves lives, but workers using a phony excuse to avoid extra work, such as a fishmonger refusing to fillet a fish because it was ‘too slippery’ (an actual West Midlands case), only makes it more difficult to enforce and ensure uniform health and safety compliance. Stress to your employees the importance of not abusing health and safety law, lest your business becomes known for using false health and safety excuses. Consult the HSE’s report, in the form of a map, to assess the prevalence of ill-founded excuses in your business’ area. You can find the map at http://press.hse.gov.uk/wp-content/uploads/Myth-Map.jpg. If you are located in Wales or the Highlands of Scotland, you can pat yourself on the back. These two areas had the smallest number of complaints related to spurious health and safety excuses, receiving only eight each. London, on the other hand, received the most with 28, with the South East close behind at 27. The West Midlands had the third-most with 24, followed by Yorkshire and the Humber with 22 and the North West and the East with 18 each. Distance your business from such bogus invocations of health and safety law, and train your employees to know and comply with the proper regulations.